This bulletin board is offered for the convenience of Hueston Sailing Association members and local sailors to post notices, items for sale, etc. All information is listed as provided by the owner. HSA has not checked out the boats to confirm any details provided by the seller. HSA is not involved in the transaction, unless otherwise noted. Contact HSA by email if you have an item you want listed. Got a boat to list? 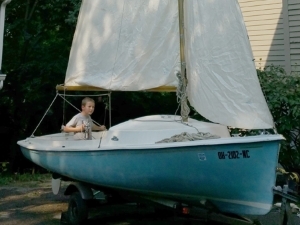 17' O'DAY Daysailer II Sailboat - Owner cannot move around like they used to. Better to find the Stemar another owner. Built by The O'Day Company, Fall River, MA. 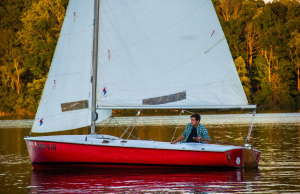 Waterline Length: 16'9" - Beam: 6'3" - Mast Height: 24'11"
Includes" Tohatsu 3.5 hp, Model MFS3.5BL (s/n 015255AE). Engine has 4.5 hours on it, still breaking it in. Trailer: greased, tires okay, electrical working. FLYING SCOT #498 - 1963 - Boat is good for daysailing, not race ready. Treated well: stored in a barn over winters and only dry sailed. New paint, trailer has new lights and paint. Trailer is in good condition. Deck of the boat has a grip paint due to racing in storms and high winds. Floatation was reinstalled a few years ago and a bow bag was put it as well as a port transom. Located in the Hamilton or Oxford, OH area. Contact: Seth at 513 939.9989 or by email. 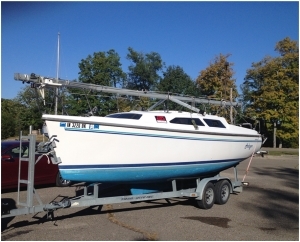 CATALINA 250 Water Ballast - 1996 - Original owner, always stored inside, Trail-Rite galvanized trailer, electric start outboard, asymmetric spinnaker, enclosed head, pop-top canvas enclosure with windows and screen, galley sink, single butane burner, 10-gallon water tank, navigation and cabin lights, completely equipped in sail away condition. $15,800 Contact Max Keck (513) 236-7648.